How about a Saratoga suggestion box? It should be easy to implement because NYRA has a Web site for everything. Then the people in Sections H of the clubhouse could ask the authorities to relocate the garbage bins from under the simulcast television sets to a hideaway where the flies and the odor aren’t a nuisance. Stan Marcinkowski of Glendale, Queens wants a policy that would result in a better seat when he buys a grandstand reserved ticket. His seat was in the back of a near vacant section in which hundreds of empty places were laid out in front of him. Season ticket holders should have a method to “re-gift” unused seats, like the neighborhood on Seinfeld re-gifted their Christmas presents. Donna Ayer of Boston, MA suggested, “I’d like a picnic table reserved with my name on it, so we don’t have to stand on line at 6:00 am.” Last weekend was the eighth year in a row that Ayer and her girlfriends have come to Saratoga on what she believes to be “the third weekend of racing.” Guess there are plenty of folks who believe the track is still the “August Place to Be.” The Spa course is in its fifth week of racing. At the end of last week, the scent of the bitter conclusion to the meet was becoming noticeable. But, on Wednesday, the scent that holders of place tickets on Drumette in the sixth could detect was the scent of larceny. The stewards refused to move the maiden filly from third to second although she was mugged like a tourist. Orangeblackandgold was the perp. Silent Joy was the winner. John R. Velazquez must have had God on his side in the following race, the St. Mary’s Hospital Association purse. Eugene Melnyk’s Moon Town was the rage. But the heavily-bet son of Speightstown ran out of the money as Pleasant Strike rolled home a winner because the jockey saw a hole on the rail open up. At 11:00 am in the walking ring, Saratoga hosted about 200 members of the press, friends and representatives of the 11 Travers Stakes runners to a draw of post positions for Saturday’s Midsummer Derby. Trainers John Kimmel, Kiaran McLaughlin and Pletcher all said that almost any horse could win – that’s how close this renewal, the 141st, is predicted to be. The program’s emcee Tom Durkin predicted correctly that no turf writer would use as his lead that Mary Todd Lincoln attended the first Travers. Yet, his note is a good point to end with. 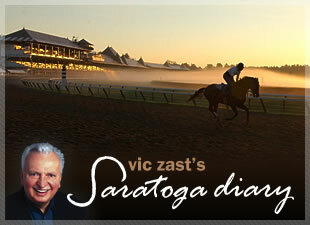 Vic Zast is a veteran of 47 Saratoga summers. He is the former president of Finger Lakes and Turfway Park racetracks.